Patio designs create outdoor additions to homes. They may serve as external dining rooms, entertainment rooms, recreation areas, as well as safe places for children to play. A well-designed outdoor living space is beautiful, useful, and adds to your home's value. 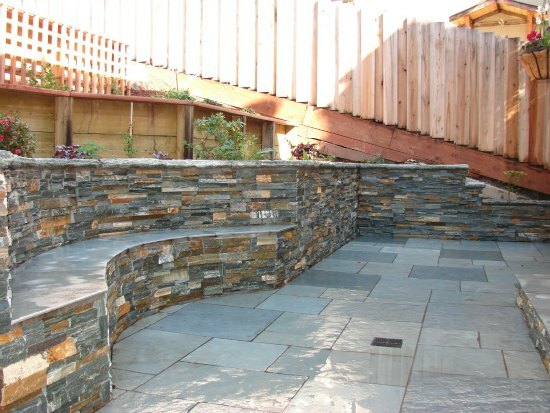 The design for your outdoor space can be as conventional or creative as you desire. The style can be traditional, rustic, cottage, modern, or something uniquely your own. Because of the wide range of possibilities, a variety of materials may be used. For instance, brick designs can include a basketweave, harringbone, or running bond patterns. 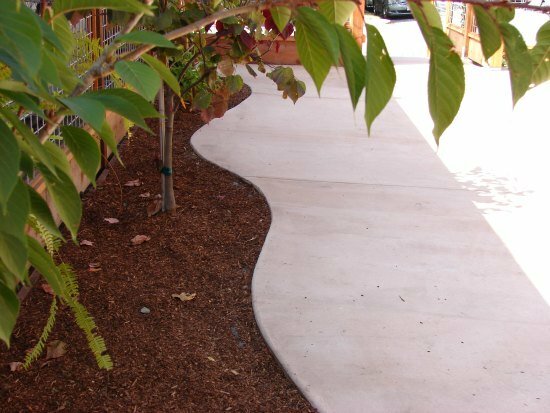 Concrete is inexpensive, very durable, and can be used in a multitude of styles. Gravel, which tends to be less expensive than other materials, can serve as a formal flooring material or it can work in a comfy area of your vegetable garden. In addition to hardscape, a design may also include a deck which defines your outdoor floor while extending the footprint of your house. Our designs integrate effortlessly with your home while complementing your garden. Your new outdoor room can also be accentuated with trellises, arbors, pergolas and other structures that fulfill your vision. For instance, a patio water feature creates a sensuous, meditative atmosphere. 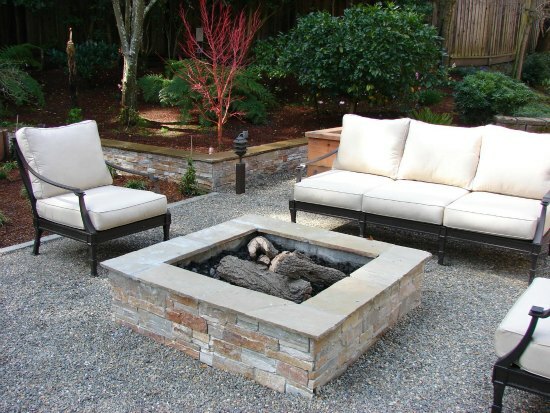 An outside fire pit invites friends and family to the warmth and community of an open fire. Your new outdoor space can even be furnished like an indoor room. Or you can create an outdoor kitchen for al fresco dining. A patio that is connected to your home can serve as a nearly imperceptible transition point between indoors and outdoors that invites you and your guests to step outside and enjoy the garden. Our garden patio designs can create secluded areas that are completely separate from your house. This design can take advantage of a specific area of your property, like a particularly sunny patch of your garden or a particularly stunning view. The wings of a house can be united with a courtyard patio to become an integral part of the home's living space. Our patios add beauty and usability to your outdoor space while adding to your home's value. A well-built patio can increase property value by more than 12%. Let Sarah Ray Landscape Design create an outdoor living space that fits seamlessly into your home, property, and lifestyle. 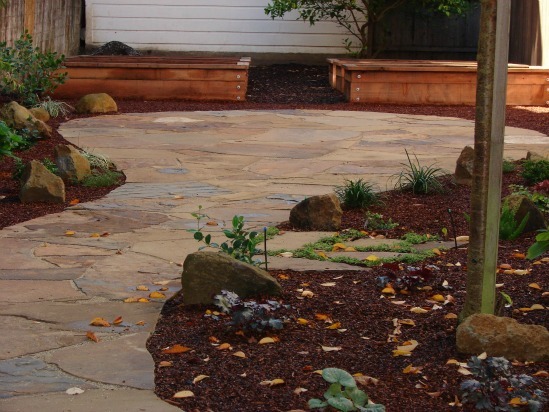 There are few simple steps to ensure success if you are interested in laying flagstone patio on concrete yourself. 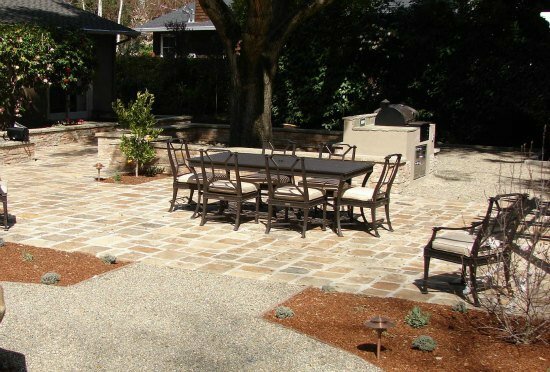 Installing flagstone patio in compacted base rock and sand is less expensive than setting a similar feature on a concrete base. 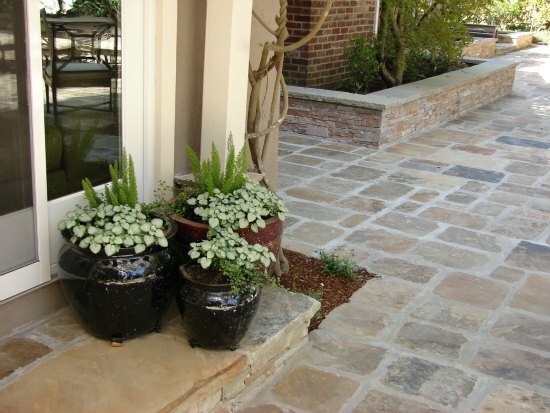 Installing pavers in patios and walkways provides a more uniformed, man-made look than flagstones.